Human IL23A & IL12B, His Tag (ILB-H52W5) is expressed from human 293 cells (HEK293). It contains AA Arg 20 - Pro 189 (IL23A) & Ile 23 - Ser 328 (IL12B) (Accession # NP_057668 (IL23A) & AAH67499 (IL12B)). 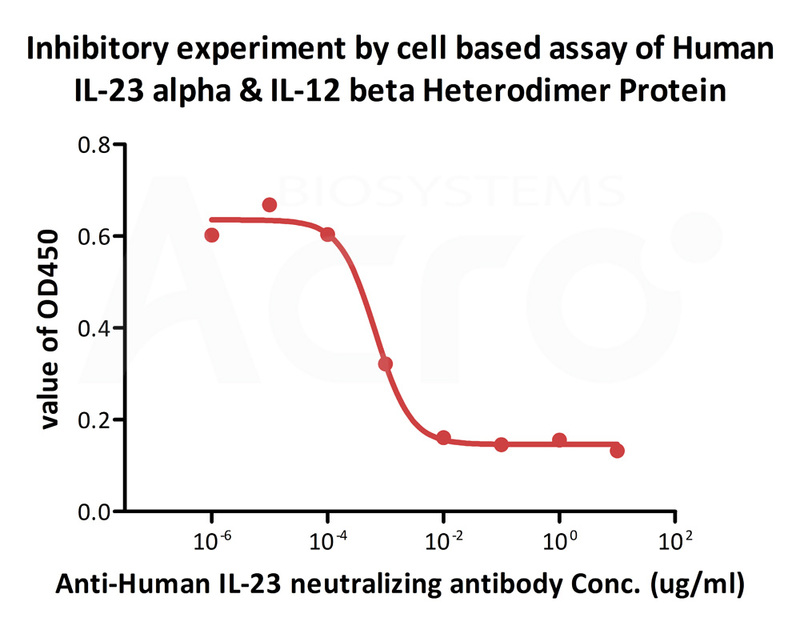 Human IL-23 alpha & IL-12 beta Heterodimer Protein, produced by co-expression of IL-23 alpha and IL-12 beta, has a calculated MW of 19.5 kDa (IL-23 alpha) and 34.7 kDa (IL-12 beta). Subunit IL-23 alpha is fused with a polyhistidine tag at the N-terminus and subunit IL-12 beta contains no tag. The predicted N-terminus is His (IL23A) & Ile 23 (IL12B). The reducing (R) protein migrates as 20 kDa (IL-23 alpha) and 37-45 kDa (IL-12 beta) respectively due to glycosylation. Human IL23A & IL12B, His Tag on SDS-PAGE under reducing (R) condition. The gel was stained overnight with Coomassie Blue. The purity of the protein is greater than 95%. Immobilized Human IL23A & IL12B, His Tag (Cat. No. ILB-H52W5) at 2 μg/mL (100 μL/well) can bind Anti IL23A&IL12B P40 domain, Human IgG1 with a linear range of 0.05-3 ng/mL (QC tested). Captured Human IL-23 R, Fc Tag (Cat. No. ILR-H5254) on CM5 chip via anti-human IgG Fc antibodies surface can bind Human IL23A & IL12B, His Tag (Cat. No. 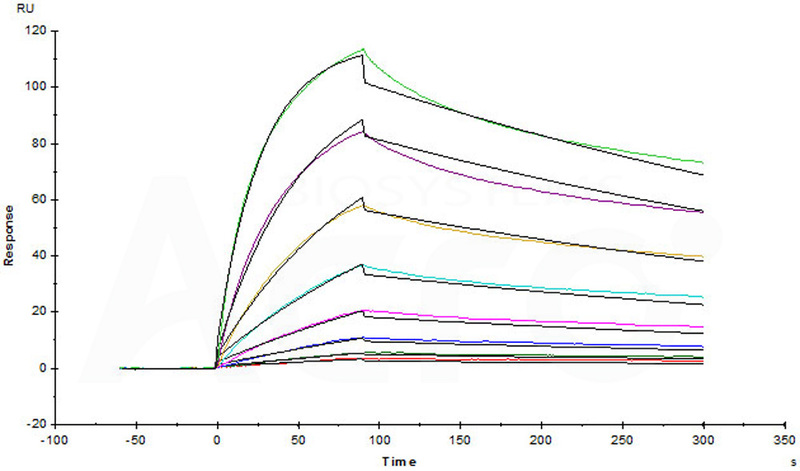 ILB-H52W5) with an affinity constant of 5.36 nM as determined in a SPR assay (Biacore T200) (Routinely tested). 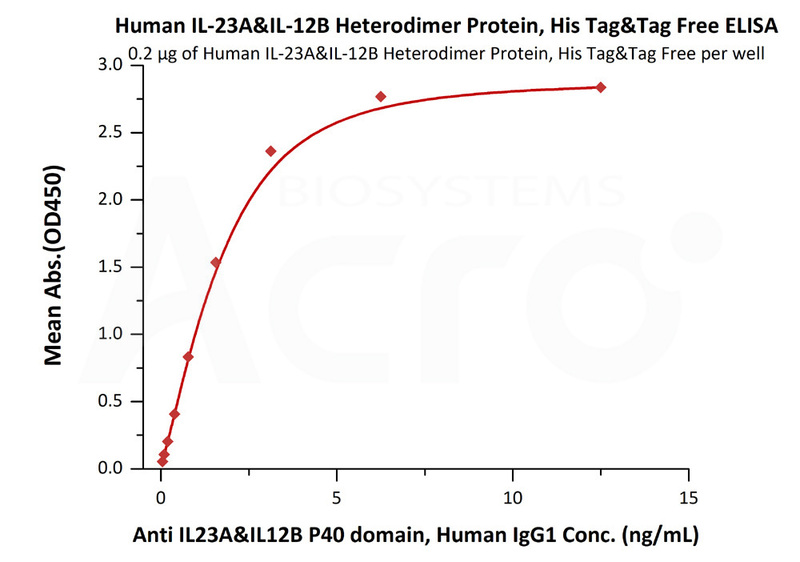 Human IL-23 alpha & IL-12 beta Heterodimer Protein(Cat. No. 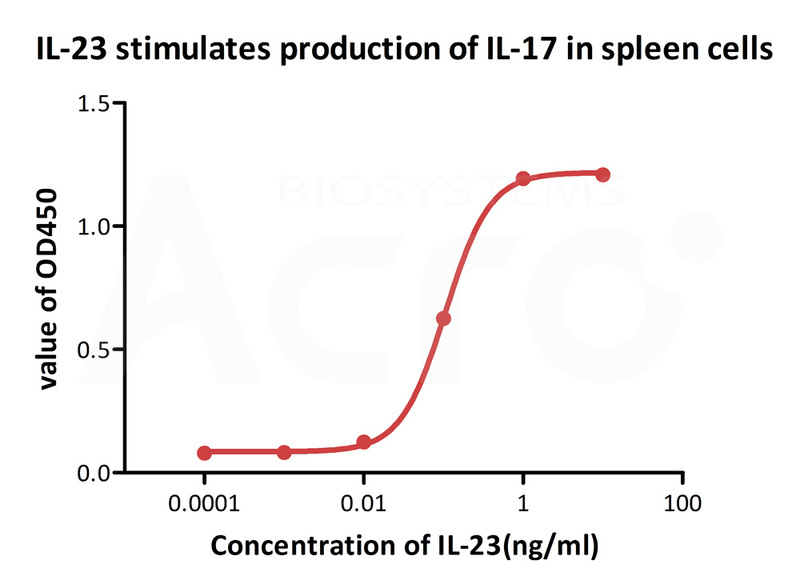 ILB-H52W5) stimulates secretion of IL-17 by mouse spleen cells. The ED50 for this effect is 0.1055-0.1635 ng/ml (Routinely tested). Cell based assay shows that the secretion of IL-17 induced by Human IL-23 alpha & IL-12 beta Heterodimer Protein (Cat. No. 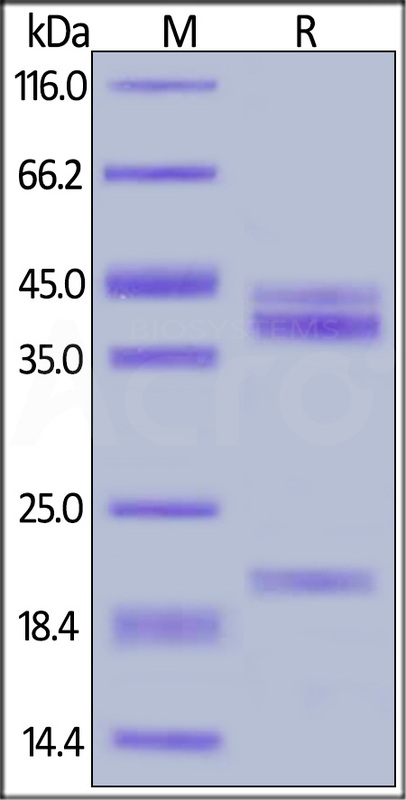 ILB-H52W5) is inhibited by increasing concentration of the anti-human IL-23 neutralizing antibody. The IC50 is between 0.67-1.50 ng/mL (Routinely tested).